Evergreen tree, 4–7 m tall. Leaf-blade obovate (2.5–)9–16 cm long, (1.8–)3.8–6.5 cm wide, acumen slender, 7 mm long, edge of cuneate base concave, lateral nerves (4–)5–6 on each side of the midrib, leathery, drying bright grey-green, glabrous. Petiole terete, very sparsely hairy, (2–)9–18 mm long, drying green, strongly swollen and black at base and apex, often angled at apex, glabrous; stipules caducous, not seen. 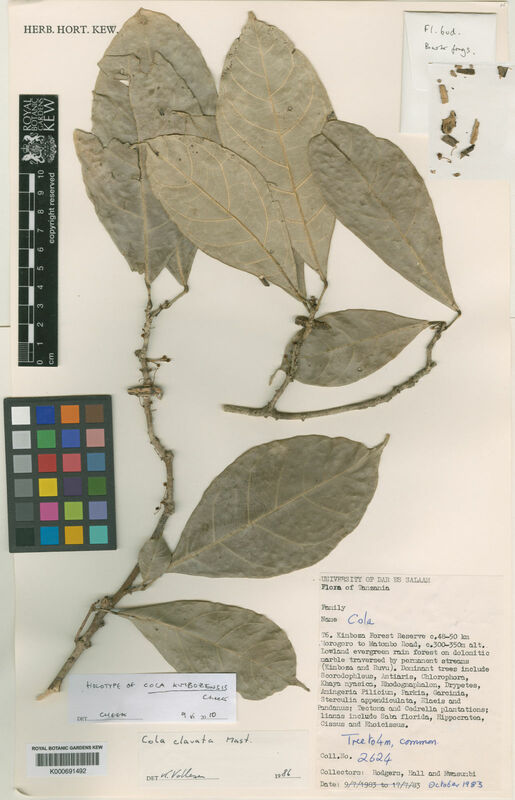 Cola kimbozensis is only known from the three collections cited from the Kimboza forest, notes upon which are given under Cola quentinii. According to Rodgers et al. 2624, it is common there, at least locally, but despite this, due to its very narrow geographical range and the threats to its habitat (see under Cola quentinii above), it is here assessed as CR B2a, b(iii), that is critically endangered.